The New York State Department of Environmental Conservation (DEC) released the Draft Piermont Marsh Reserve Management Plan for public comment, Commissioner Basil Seggos announced Wednesday. A public meeting will be held at 7-9 p.m. on Feb. 5, 2018, at Piermont Village Hall, 478 Piermont Avenue, Piermont, NY. The meeting will provide the public with an opportunity to learn more about the proposed management actions in the draft plan and to share comments. The meeting facility is wheelchair accessible. Please submit requests for specific accommodations to hrnerr@dec.ny.gov. In case of inclement weather, the meeting will be postponed to Feb. 8, 2018 and notice will be given on the website www.hrnerr.org. The draft plan was released in the Environmental Notice Bulletin on January 17, 2018. The DEC says the plan will guide management of the Piermont Marsh Reserve for the next decade, including marsh management, habitat restoration, resource stewardship, public access, education programs and research. The plan ” provides a foundation for increased educational programming, greater community participation in stewardship and direction for collaboration among research partners,” the DEC says. The plan covers the next 10 years and establishes a long-term management strategy to monitor and support marsh resilience and conservation. A buffer of more than 200 acres of unmanaged marsh will be retained to provide storm protection for neighboring landowners. Habitat restoration focusing on a 10-acre site at the center of the marsh, more than one-half mile from neighboring residential areas, will be treated to reduce the abundance of Phragmites and facilitate the return of native plants. If this project is successful in restoring native communities and meeting other performance benchmarks, two adjoining 15-acre units will be treated (successively) over the next 10 years to restore native ecological communities. The total potential restoration is 40 acres, which represents 15 percent of the marsh. Stewardship projects, including eel passage at Ferdon Dam, rare species protection, and nest boxes are planned. Access improvements will be explored, including a marsh boardwalk. Expanded educational programming including on-land and canoe programs, as well as presentations about marsh restoration and ecology. Research and monitoring focused on marsh ecology, resilience to sea level rise, impacts of restoration, and the marsh’s role in protecting the Village of Piermont. 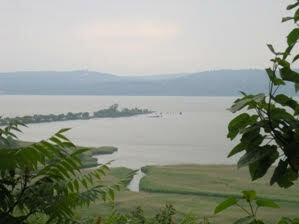 The Piermont Marsh Reserve hugs the base of Tallman Mountain along the west shore of the Tappan Zee, the widest part of the tidal Hudson River, and extends 1.5 miles below Piermont Pier. The site’s 1,030 acres include the Hudson River Estuary’s largest brackish tidal marsh, a broad swath of adjacent shallows, and small areas of upland in the village. The marsh and shallow-water habitats are regionally rare, ecologically significant, and historically home to a host of specially adapted plants and animals. Access to the interior of Piermont Marsh is limited, though the tidal creeks and shallows can be experienced by canoe or kayak. Residents and visitors can enjoy close views of Piermont Marsh and its adjacent shallows from several land locations in the village of Piermont and Tallman Mountain State Park. DEC will accept comments on the draft plan until March 1, 2018. The draft plan can be viewed and downloaded at: http://www.dec.ny.gov/lands/92365.html. Paper copies are also available for review at the Dennis P. McHugh Piermont Public Library, 25 Flywheel Park, Piermont, NY and at the DEC Region 3 Office, 21 South Putt Corners Rd, New Paltz, NY. Paper copies may be requested from hrnerr@dec.ny.gov. Written comments may be mailed to Reserve Manager, NYS DEC, PO Box 315, Staatsburg, NY 12580 or emailed to hrnerr@dec.ny.gov.